Yet another prosecution from the Obama DOJ for an act the president once hailed as "courageous patriotism"
"They’re going after this at every opportunity and with unmatched vigor," said Steven Aftergood of the Federation of American Scientists, a critic of government classification policy. . . . Some experts said the administration and the Justice Department may be trying to appease the intelligence community after angering many by releasing the so-called torture memos and by reopening inquiries into alleged torture by CIA personnel. Others said intelligence personnel are terrified by outlets like Wikileaks, on which classified information can be posted without any meaningful chance for officials to argue for the withholding of details that could damage U.S. intelligence efforts. "I think it's remarkable," said Gabriel Schoenfeld, a fellow at the conservative Hudson Institute who urged prosecution of The New York Times for publishing details of the Bush administration’s warrantless wiretapping program in 2005. "This is the administration that came in pledging maximum transparency. Plugging leaks is ... traditionally not associated with openness". . . .
"If Thomas Drake is convicted and sentenced to jail, this will be the first president to send two leakers to prison in his term in office. That’s never happened before,' said Schoenfeld, author of the book "Necessary Secrets." "You wouldn't have expected the Holder Justice Department to be particularly hawkish in these matters." Schoenfeld was frequently critical of what he considered to be the Bush DOJ's lackadaisical attitude toward punishing whistleblowers, but he is obviously pleased with the Obama administration's aggression in that regard. It isn't hard to see why Obama despises leaks. Just look at the front page of The New York Times today, which details a secret order from Gen. David Petraeus last fall ordering vastly increased Special Forces operations in a variety of Middle Eastern countries, including "allies" such as Saudi Arabia and Yemen, and "enemies" such as Iran and Syria. As Iran experts Flynt Leverett and Hillary Mann Leverett contend, this constitutes, at the very least, "the intensification of America's covert war against Iran." That is how we also learned of what is, in essence, a covert war in Yemen as well (not to mention the covert war in Pakistan). Most of what our Government does of any real significance happens in the dark. Whistleblowers are one of the very few avenues we have left for learning about any of that. And politicians eager to preserve their own power and ability to operate in secret -- such as Barack Obama -- see whistleblowers as their Top Enemy. Hence, we have a series of aggressive prosecutions from the Obama administration of Bush era exposures of abuse and illegality -- acts that flagrantly violate Obama's Look Forward, Not Backward decree used to protect high-level Bush administration criminals. 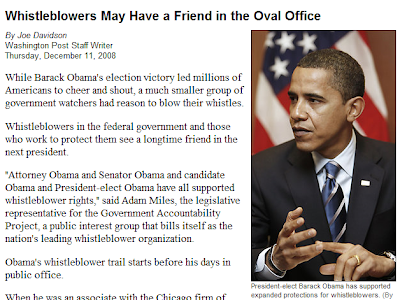 As John Cole has suggested, perhaps if these whistleblowers had tortured some people and illegally eavesdropped on others, they would receive the immunity that Obama has so magnanimously and selectively granted. Instead, they merely exposed secret government corruption and illegality to the world, and thus must be punished. But there's one big exception to this rule: when the system has itself been corrupted. When you're operating within a system in which whistle-blowers' concerns are not addressed -- where the likelihood that any complaint you make within the system will be addressed is near zero, while the likelihood that you will be targeted for reprisals is high -- then no sane person who is motivated by a desire to have his or her concern addressed will work within that system. As the Post article summarized: "there is plenty of evidence to make whistleblower advocates think the future for their issue will be better than its past." I think they have now been decisively disabused of such expectations. The Most Transparent Administration Ever seems to despise nobody quite as much as those who exposed Bush era corruption and lawbreaking, all with an eye towards deterring anyone who might do the same during this administration. UPDATE: It is growing increasingly difficult to dispute this, is it not?